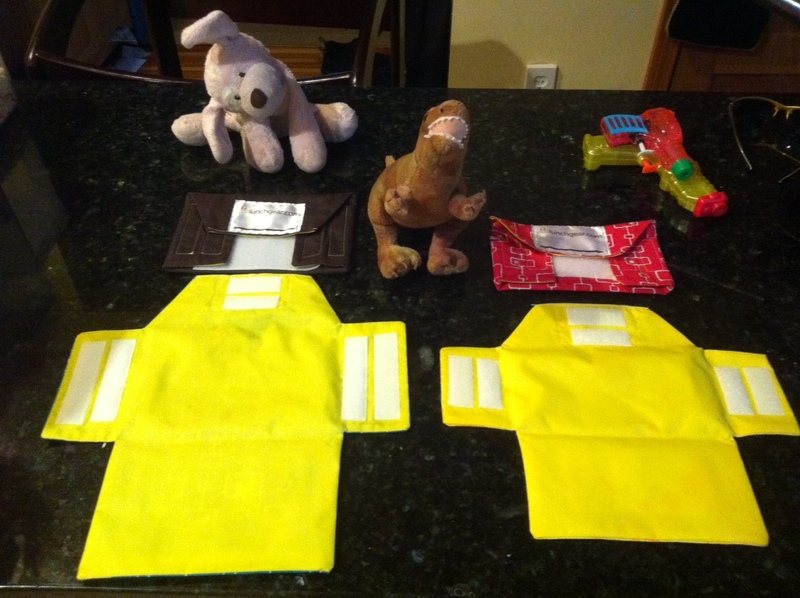 Several years ago, I discovered Eco Lunch Gear, a fabric alternative to Ziplocs. I’ve been using them in combination with air-tight plastic snack containers ever since. Recently I received an email from Tina Beatty, the owner of Eco Lunch Gear, telling me that she is closing down Eco Lunch Gear and setting up a new shop on Etsy called The Bay Owl. I’ve loved using these wraps over the years (and have since reordered more at least twice), so thought I’d take the opportunity to give her a little free publicity. When my daughter graduated from purees to Cheerios in late 2008, I suddenly found myself carrying around a lot of snacks. The demand for snack totage has only increased as my daughter has gotten older and the length of time we can be out in the world on a single trip has increased (thereby increasing the volume of snacks she consumes per outing). At first, I used Take and Toss containers to carry the various snacks, but they were so bulky. After a while, I decided I needed something more streamlined so that I could be prepared for an outbreak of snacking without being forced to lug around a 15 gallon tote. So I started using Ziplocs. But the intellectual dissonance of tossing out four Ziplocs a day while virtuously recycling whatever else I could inevitably took its toll. 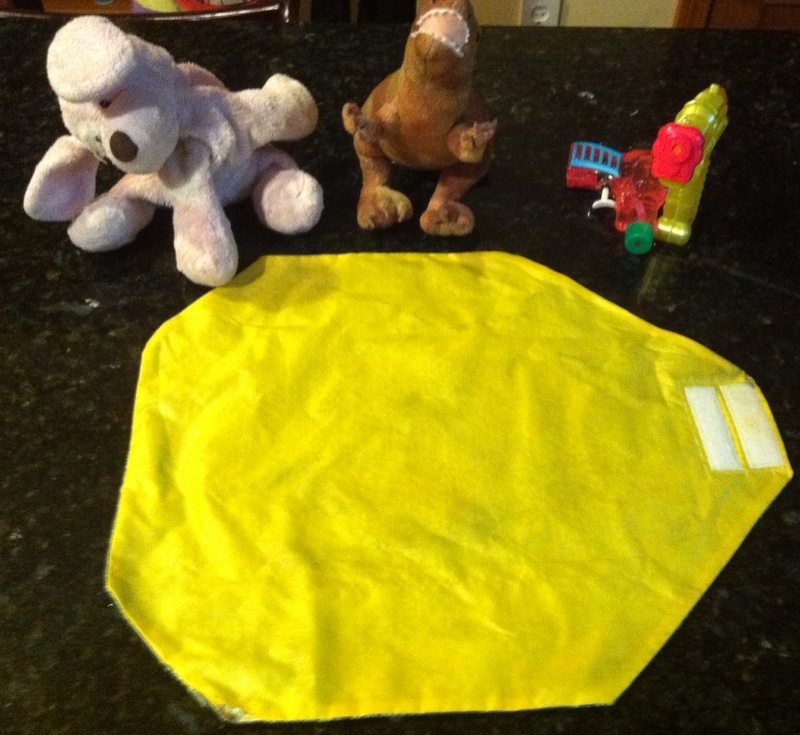 In 2009, I decided to find out whether there were viable alternatives to using plastic baggies — other than returning to the completely functional, but somewhat bulky Take and Toss’s. I found a few options on Amazon, but as a recovering quilter I have a residual love of unusual fabrics that prevented me from ordering anything in gingham. So in a relatively rare move for me, I went off-Amazon to see what the web at large had to offer. And that’s how I came across Eco Lunch Gear. 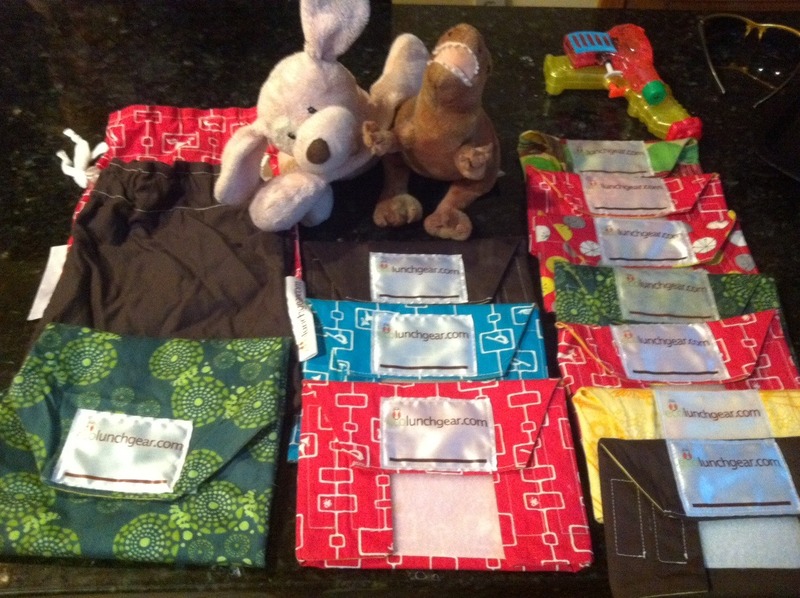 Run by a work-at-home mom in Traverse City, Michigan, Eco Lunch Gear offers a variety of reusable fabric snack bags, sandwich wraps, and lunch bags in cheerful and occasionally conservative prints. Made with organic cotton and lined with nylon (no nasty vinyl or potentially poisonous plastics here), they are designed to open completely for easy washing and complete removal of crumbs. I liked that you could wash them in the kitchen sink with dish soap and let them dry overnight. And I really liked that they were sealed with Velcro, because that meant my daughter would be able to open them on her own almost from the start. So I ordered a few snack bags, a couple of sandwich wraps, and a cinch bag. Almost a complete set of what was available at the time. 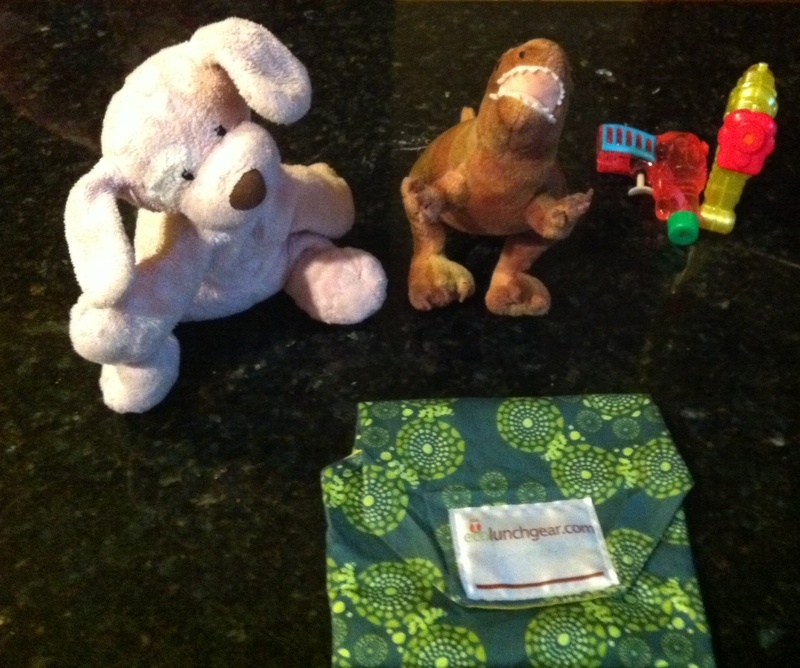 Tina, the owner of Eco Lunch Gear, threw in the only item I hadn’t ordered, the tissue holder, as a thank you. After a few months of use, the bags were working well for us and I was almost completely weaned off Ziplocs, Saran Wrap, and parchment paper with a few exceptions. The open Sandwich wrap, complete with burn mark in the lower left hand corner from an extra exciting outing. The first exception involves the sandwich wrap. Made extra-large to hold oddly shaped sandwiches while doubling as a place mat during the actual eating process, the sandwich wrap doesn’t have much structure to it. As a result, I don’t really trust that my sandwich stays clean. So I almost never use it. Or if I do, I tend to wrap the sandwich in parchment paper first, which kind of undercuts the whole eco-friendly zero waste lunch idea. Also, the bags do get damp if you use them with wet things, like pickles, which my daughter would eat by the jar if I’d let her, or carrots that have been washed and prepped but not dried, which is a bit of an adjustment from the externally dry-to-the-touch plastic baggies and containers. Some days I can deal with this. Some days I can’t. On those days, I break out the Take and Toss. For a long time, I was also dubious about the company’s claim that their sandwich wraps and snack bags wouldn’t stain. But two years later, it seems to be mostly true, as long as you at least rinse off things like jam, mustard, and ketchup the same night the bags are used, and don’t let the badness soak in for days. I, of course, never get behind on laundry. Extra large Snack bag on left. The open snack bag on the right is from my original purchase two years ago. Note that it remains stain-free despite my best efforts. So when the Inexplicable and Quite Unseemly Mold Attack of 2010 took out about half of my Eco Lunch Gear set, I restocked. By then they had created the Jumbo Snack Bags, which I find are large enough to carry the average sandwich. So I replaced the floppy-doubles-as-a-placemat sandwich wraps that had succumbed to the Vicious Mold Incident with the larger snack bags and have had no cause to regret that decision over the past year of use. If you are looking for an alternative to plastic sandwich and snack bags, there are a lot more options on the market now than when I first started hunting in 2009. I can’t comment on any of those. I’ve been too happy with my Eco Lunch Gear to try anything else.